The delicate, lush carving on this elegant commode and mirror relate it to the circle of the celebrated Turinese cabinet-maker Giuseppe Maria Bonzanigo, appointed sculptor to the Royal court of Turin in 1787 by Vittorio Amedeo III. Skilled craftsmen and intagliatori such as Francesco Tanadei, Giuseppe Marchino, Francesco Novaro and Francesco Bolgih were working around Bonzanigo on the numerous royal commissions for the residences of Stupinigi, Moncalieri, Venaria, Rivoli and most of all the Royal Palace in Turin. The jewel-like, naturalistic quality of their work can be seen on the drapery swags issuing from the urn form cresting on the mirror and the carved panels. A related commode with carved paneled drawers in the apartment of the Duchess d'Aosta in the Palazo Reale is illustrated in G. Ferraris,Guiseppe Maria Bonzanigo, Turin, 1991, p.110. 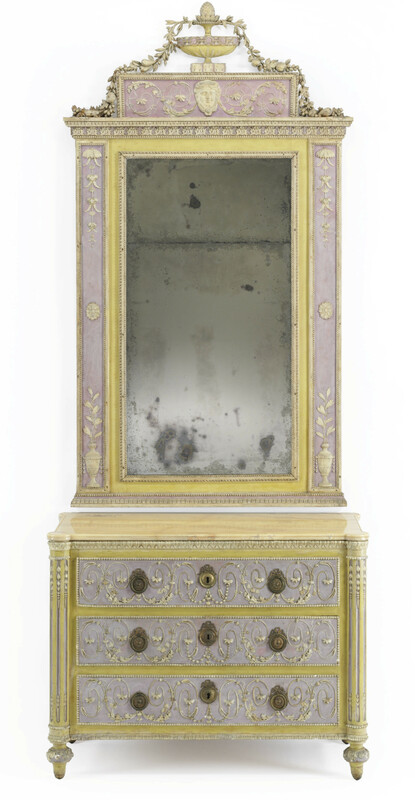 An armoire, by Bonzanigo with a related pastel color scheme and carving is illustrated in S. Colombo, L'Arte del Mobile in Italia, Milan, 1975 fig. 294.